"The gratidude of every home in our Island, in our Empire, and indeed throughout the world, except in the abodes ofthe guilty, goes out to the British airmen, who, undaunted by the odd, unwearied in their constant challenge and mortal danger, are turning the tide of the world war by their prowes and their devotion. Never in the field of human conflict was so much owed by so many to so few"
After Dunkirk there was again a brief period of comparative peace as both sides took stock and prepared for the next awful confrontation. This was the Battle of Britain during which the German Luftwaffe sought to destroy the RAF so as to frighten Britain into submission, or if Britain could not be cowed to allow the German army to attack England. The Battle of Britain was perhaps the longest and most intensive air battle in history and was also to be Germany's first major reverse of World War II. Amongst the Squadrons and pilots that flew from RAF Hornchurch in this period were some of the most famous and highest scoring of the war and included the Spitfire equipped 41, 54, 65, 74, 222, 266, 603 and 611 Squadrons, the Defiant equipped 264 Squadron and the Blenheim equipped 600 Squadron. 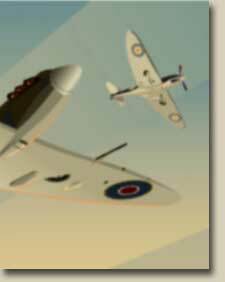 The Battle of Britain began on or about the 8th July 1940 with Luftwaffe attacks on British channel convoys. During this phase German pilots mostly held the upper hand and finally and drove British shipping from the channel in daylight hours. The Spitfire squadrons at Hornchurch were heavily engaged during these channel battles with a 74 Squadron spitfire claiming the first German fighter to be shot down on British soil on July 8th. During this period the 11 group commander, Air Vice Marshall Park made concerted efforts to rest his battle wearied pilots by rotating squadrons between the embattled forward airfields such as Hornchurch and quieter sectors elsewhere in Britain especially as was too often the case if they suffered heavy casualties. This would be continued throughout the desperate fighting that followed. The main phase of the Battle of Britain began on August 13th 1940, named Adlertag (Eagle Day) by the Germans. This was the beginning of a prolonged and intensive assault on the British air defences that was initially concentrated on the coastal airfields and radar stations. Soon, however, the Luftwaffe's activities spread further inland and on 18th August, during the most intensive air battles of the entire battle, RAF Hornchurch was bombed for the first time. This was only the first of at least ten bombing raids on RAF Hornchurch with the heaviest attacks occurring on August 24th and August 31st. During these bombing raids the flight ways were cratered, a new officers mess was destroyed and parts of the dispersal areas damaged and vital phone lines cut. Residential housing in Elm Park was also hit and on at least two occasions planes were caught taking off and destroyed during raids. Even as bombs dropped around them, Hornchurch's stalwart ground crews continued to work to service, refuel and rearm aircraft and between raids all spare hands and a faithful steam traction engine were put to work levelling the cratered flight lines. The Sector Operations room was also moved to the safety of a temporary facility in Rainham before a more permanent home was found in the Masonic Hall in Romford. By the beginning of September the strain on Fighter Command was beginning to tell and defeat seemed possible. All of the Squadrons that were rotated through RAF Hornchurch took casualties during this period but worst affected was the Boulton Paul Defiant equipped 264 Squadron who were withdrawn from the day battles after only a week due to their casualties. On 7th September 1940, however the Luftwaffe changed its tactics and began to concentrate on bombing London giving the battle weary fighter stations, such as Hornchurch a break from intensive air attacks. This gave Park's embattled 11 Group a chance to regroup. It also brought the Luftwaffe bombers within reach of Leigh Mallory's so far mainly un-engaged 12 Group. The losses inflicted on the German bomber formations in their day light attacks on London that culminated on September 15th (now remembered as Battle of Britain Day) persuaded the Luftwaffe that the RAF was in fact far from beaten and that an invasion of England would not be possible in 1940. Instead of massed bombing raids by day, the Luftwaffe now began its campaign of night blitzes against London and other British cities. However, Hornchurch remained in the forefront of battle as the Luftwaffe launched massive daylight fighter and fighter bomber sweeps and also sent small groups of night intruders to bomb air fields, including Hornchurch. Hornchurch's night fighting 600 Squadron was also involved in pioneering the dark art of intercepting enemy bombers by night. British sources regard 31st October 1940 as the end of the Battle of Briatin although intensive night bombing, night intruder raids and day light Fighter bomber sweeps continued into the spring of 1941 when much the Luftwaffe was forced to move its resources eastwards in anticipation of the German attack on Soviet Russia. During the Battle of Britain Hornchurch pilots accounted for 205 German bombers and fighters destroyed and probably many more severely damaged. The top scoring Squadrons were 603 Squadron with 58 enemy destroyed. and 41 Squadron with 45 enemy destroyed. In return, however, 144 Hornchurch Planes were destroyed and 68 Hornchurch pilots died. Many of these dead are buried in the cemetery of St Andrews Church, Hornchurch.